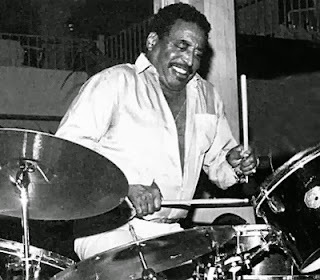 November 26, 2013, 9:10 a.m.
Bandleader, drummer and NEA jazz master Chico Hamilton has died. He was 92 years old. Born Foreststorn Hamilton in Los Angeles in 1921, Hamilton's music career began with some notable high school classmates including future legends in their own right, Dexter Gordon and Charles Mingus. He eventually went on to perform and tour with Lester Young, Lena Horne and Gerry Mulligan before putting together his first quintet in 1955. A landmark group that forged the sound of West Coast jazz while featuring the reeds of Buddy Collette, guitarist Jim Hall, Carson Smith on bass and cellist Fred Katz, the group evolved through a wealth of jazz talent, including Eric Dolphy, Gabor Szabo and Charles Lloyd, who joined the band in 1960. Hamilton's profile was such that he eventually felt the pull of Hollywood, and his group made a notable cameo in "Sweet Smell of Success" in 1957, which starred Tony Curtis and Burt Lancaster and also featured Hamilton's music. He later wrote the soundtrack for Roman Polanski's thriller "Repulsion" in 1965. Hamilton continued leading a number of ensembles, including a soul-jazz album featuring Larry Coryell, "The Dealer," in 1966 and later the group Euphoria in the '80s and '90s. He also moved into education, teaching at the Parsons New School of Jazz in New York City and the Mannes College of Music at the New School University. He was named an NEA Jazz Master in 2004 and continued to record up to his 90th birthday in 2011. Hamilton's death was confirmed this morning by his nephew, Raoul Hamilton. Below, listen to a clip of Hamilton's first, chamber-leaning quintet performing the contemplative piece, "The Wind."